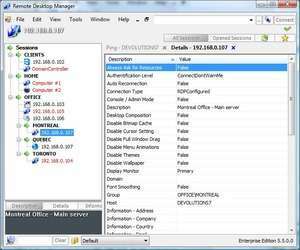 Remote Desktop Manager is an organizational and utility application which manages VPN connections. It saves addresses, passwords and ports of each remote system so that they may be access quickly. The program is also able to remember specific details of VPN remote connections such as device settings, screen resolutions/colors, networking, etc. When the administrator can't remember details of each connection, then this program comes in handy. Version 13.5 is a freeware program which does not have restrictions and it's free so it doesn't cost anything. For security reasons, you should also check out the Remote Desktop Manager download at LO4D.com which includes virus and malware tests. Additional screenshots of this application download may be available, too.